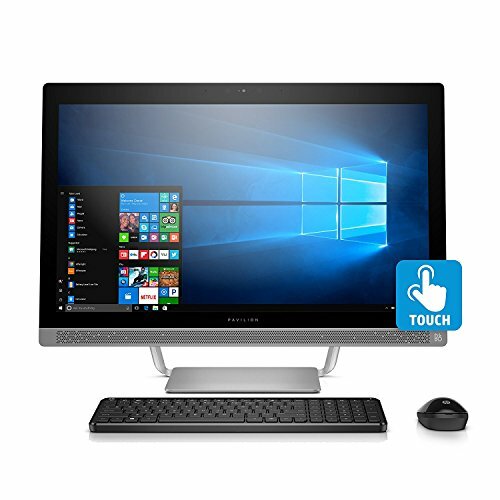 The new Powerfully engaging HP Pavilion 27 All-in-One comes with an industry-leading EXTREME-power i7-7700K processor so your family can surf, stream, work, and play with all the power they need. The HP Pavilion 27" brings style and performance to the center of your home. The stunning and elegant HP Pavilion 27 TOUCHSCREEN packs as much ULTRA power as it does gorgeous looks. This EXTREME edition All-in-One PC is packed with Intel's latest Core i7 processor i7-7700K QUAD with a TURBO BOOST of 4.50GHz - the FASTEST-TO-DATE cpu, it is topped off with 16 GB of RAM for SUPERIOR performance and comes with a FAST 500 GB SSD drive that will keep your system SUPER FAST! This All-in-One is beautifully styled to be the centerpiece of your home. The small footprint of its sleek design takes up less space, while adding a modern touch to your desk. An entertainment standout - with the brilliant edge-to-edge Full HD IPS display and dual front-firing Bang & Olufsen speakers custom-tuned by B&O PLAY, captivate your family with immersive entertainment. Comes with a 27" Brilliant diagonal TOUCHSCREEN IPS FHD WLED-backlit display (1920x1080). It is also equipped with a built-in HP HD WEBCAM and mic, DVD-writer, Bang & Olufsen speakers, 3- in-1 (SD/SDHC/SDXC) card, Gigabit Ethernet RJ45 port, 802.11a/b/g/n/ac (1x1) and Bluetooth 4.0 M.2, 1x USB 3.0 Type-C; 2x USB 3.0; 2x USB 2.0, HDMI port, wireless keyboard/mouse and MUCH MORE.